In just eight years, Xiaomi has built quite the empire for themselves with an extensive collection of smart home devices, smartphones and even lifestyle products. Today, they’re taking another step towards the future as the company just announced that they’ve been successfully listed on the main board of the The Stock Exchange of Hong Kong Limited. To celebrate this occasion, the company announced a whole bunch of discounts and promotions for some of their most popular products. 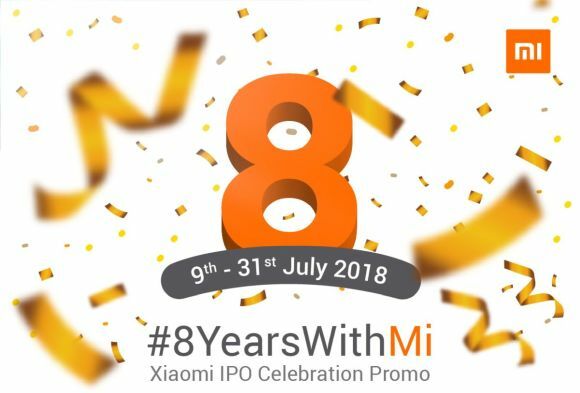 Dubbed the 8YearsWithMi campaign, the smartphone maker is slashing prices off some of their devices, bundling powerbanks with others and throwing in a couple of purchase with purchase (PWP) deals as well. This promotion will run from the 9th to 31st of July 2018. If you’ve had your eye on the Xiaomi Redmi Note 5 — our king of budget handsets under RM1,200 — now’s a great time to pick one up. 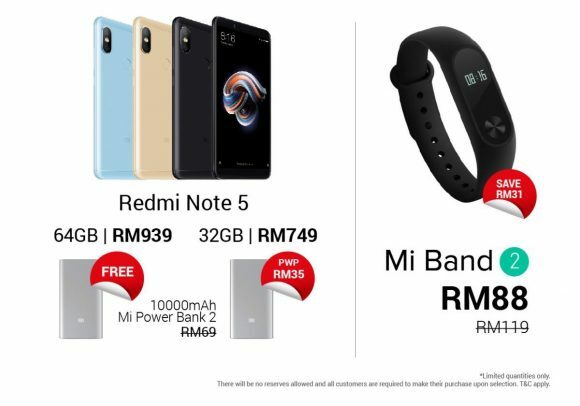 During the promotional period, every customer who purchases a brand new 64GB Xiaomi Redmi Note 5 (priced at RM939) will also receive a 10,000 mAh Mi Powerbank 2 worth RM69. Additionally, if you pick up the 32GB model instead (priced at RM749) you will be eligible for a PWP offer where you can pick up that same Mi Powerbank 2 for RM35. Alternatively, you can also buy the powerbank outright for RM59 (RM10 discount) instead. Besides that, Xiaomi’s Mi Band 2 is also getting a discount during this promotion. Normally priced at RM119, you can now buy a brand new Mi Band 2 for RM88 instead. Finally, if you don’t mind picking up some of Xiaomi’s older devices, the company is also slashing the prices off their popular Redmi Note 4 and Mi A1 devices. Now, you can pick up a Redmi Note 4 (4GB RAM, 64GB storage) for RM569 and a Mi A1 (4GB RAM, 32GB storage) for RM589. Both devices also come with a screen protector and case for free. Xiaomi is also giving discounts on the Redmi 5A where you can now pick up the device, with 2GB of RAM and 16GB of storage, for RM329. In addition to sales, Xiaomi’s also holding a Mi Photographer Contest where users can participate and stand a chance to win prizes that include a Mi Band 2, Mi Powerbank 2 and Mi Selfie Stick. To participate, just post your most creative photo using the hashtag #ShotOnRedmiNote5 during the contest period. Eight winners will be announced on the 1st of August.